Tom Trobjevic and James Tedesco have boosted their World Cup selection chances by scoring hat-tricks in the Australian PM's XIII's 48-8 hammering of the Papua New Guinea PM's XIII on Saturday. 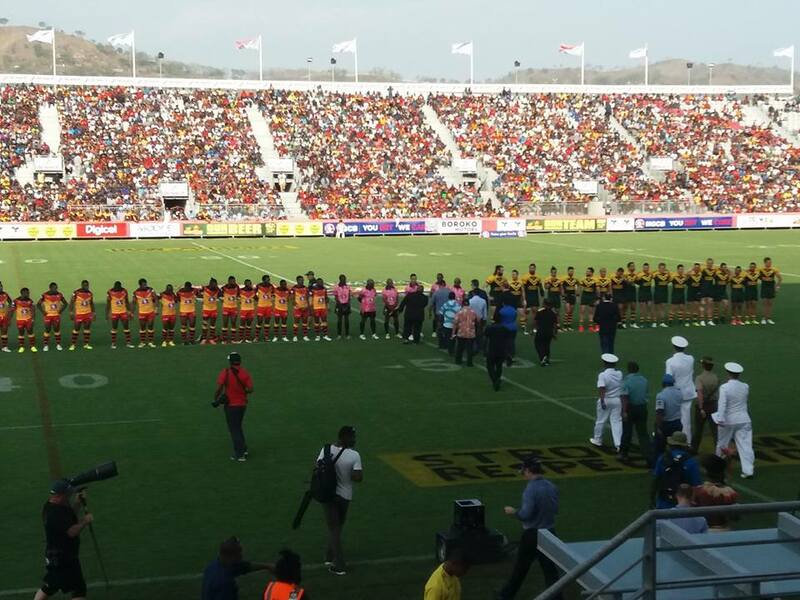 It was a clinical performance by the Mal Meninga-coached side in hot and humid conditions in front of 13,468 screaming fans at the National Football Stadium in Port Moresby. Featuring 11 players with Kangaroos experience, the Australians were made to work hard early by a PNG side missing most of their stars who were preparing to play for the PNG Hunters in the Intrust Super Cup grand final in Brisbane on Sunday. 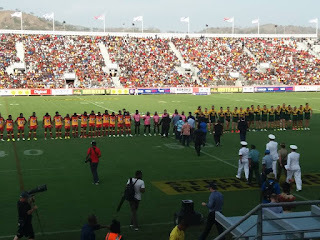 The visitors were behind 8-6 in the first half before running away with victory in a match that leaves Meninga with plenty of questions ahead of naming his squad for the World Cup later this year. The hosts dominated the opening minutes until Manly fullback Trobjevic, playing in the centres, crossed for a try in his first game in the green and gold and halfback James Maloney landed the conversion. The crowd went wild soon after when PNG centre Stanford Talita's try was converted by Jason Misian to lock the scores up. Five-eighth Misian added a penalty goal to put his side ahead and leave the visitors stunned halfway through the first half. St George-Illawarra back-rower Tyson Frizell soon after raced away to put the Australians back in front and from there it was one-way traffic. Trobjevic was gifted a second try after nice lead-up work from his brother Jake, while fullback James Tedesco scored from a Corey Norman cross-field kick just before halftime. Tedesco and five-eighth Norman combined again for the NSW No.1 to add his second try before he completed his own hat-trick in the dying minutes, a four-pointer that was converted by prop Andrew Fifita. Maloney finished with a haul of 18 points after scoring late and nailing all seven of his conversions.